"It was 2:07pm when we walked past the cafe Baristi in the sun and it did not look like it was even beginning to open, although their website listed a start time of 2:00pm, which already seemed quite late. Time slides here, like ink across the page. A lone girl in a cafe writing about how and why she couldn’t sleep with a women from the bar she met the night before. Her thoughts filling the page of a notebook she would close and stuff into her purse and then take out with her info the world…. My friend took me to his favorite café instead, a place called La Stazione, for a drink that was not coffee but instead grapefruit with a jasmine tea. There I was surprised with the slow pace with which the barista squeezed the grapefruit juice into the glass. I was surprised that he used an entire grapefruit for this drink, and squeezed its juice by hand into the cup. It was like watching someone do it for the first time. His pace set the pace for the entire trip. Everything moves slowly. The pace of one’s walking was slow - to avoid potholes and dog poop no doubt. The service at a restaurant or cafe was slow. Double the time anything takes in America. No one rushes. No one checks their watches. I am alone in my worry of time. We concluded the evening by having dinner and red wine on the top balcony of the Telefonica Gastro park. I didn’t see the sun set, I just watch the sky change colors and the lights come on overhead. It was peaceful, sublime. Later that night we ventured out to every gay bar in TJ and we did not return until 5:30 in the morning. I had intended it to be this way. I would have been disappointed if it had been any other way. 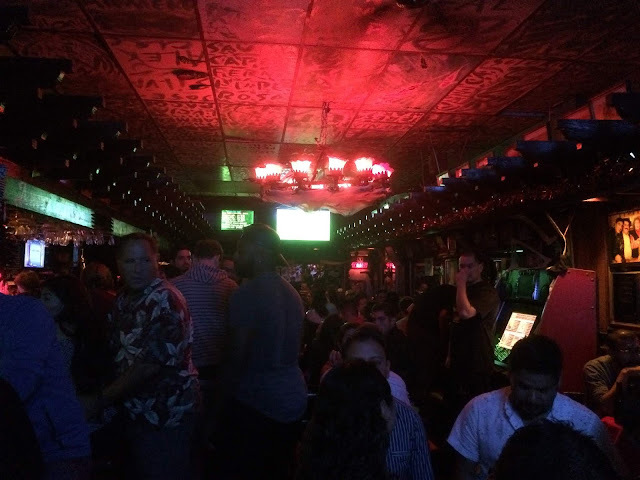 At one point, we were sitting at Dandy Del Sur, the oldest bar in Tijuana. It was so crowded there was no room to stand, even line up at the bar. So we moved between tables, between couples sitting down, so that my body practically brushed up against their faces. My friend said they didn’t mind, probably didn’t even notice it. When we finally had a chance to grab a table after one couple left, the three of us were sitting close enough to kiss. I remarked how unusual that was in American culture. We had only just met and it would be uncomfortable to sit so close. My American friend explained that in Mexico people live on top of each other so that no one has any personal space. They don’t mind pushing past each other in a crowded bar, or having their limbs touch others in public spaces. I told him it was like sitting in the middle seat of an airplane, and asking the person beside you to move so you can use the bathroom. Then instead of getting up out of their seat, they just tuck their chin in. We laughed."